As with the French Impressionists, there were many artists who were associated with the Pre-Raphaelite movement who are little-known today. Every so often I stumble across one – Marie Spartali Stillman was an example – so I here offer another. Known today for a couple of paintings, there is far more to his art than just those. 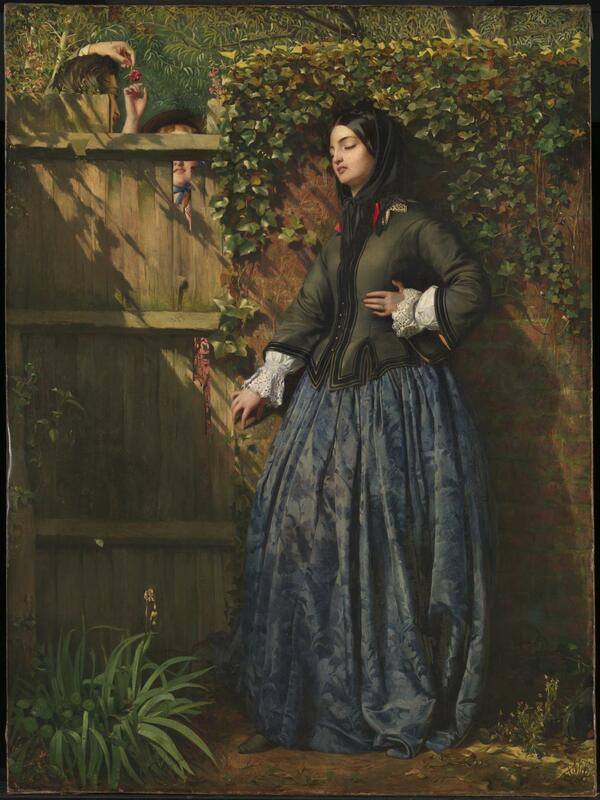 And unlike many of the Pre-Raphaelites, he specialised in strongly narrative paintings: Philip Hermogenes Calderon (1833–1898). He also happens to be an excellent example of a European migrant in Britain, who became an important figure in a very British institution – a topical issue in this increasingly xenophobic age. Calderon was born in Poitiers, France, the son of a former Spanish Roman Catholic priest, who converted to Anglicanism and became a professor of Spanish literature at King’s College, London. His mother was French. He studied in London at first, then went to Paris as a pupil in the studio of François-Edouard Picot from 1851. While still a student, he painted his By the Waters of Babylon (1852), which was exhibited at the Royal Academy in London the following year, the first of an unbroken series of works of his to be shown there until the year of his death. The reference is to Psalm 137 of the Old Testament, in which the exiled Jewish people express their yearning for Jerusalem, after it had been conquered by the Babylonians. The opening words are variously translated as By the rivers of Babylon or By the waters of Babylon, and talk of the sadness of the Israelites in exile – the sentiment expressed clearly in Calderon’s painting. Philip Hermogenes Calderon (1833–1898), “Lord, Thy Will Be Done” (1855), oil on canvas, 55.9 x 46.4 cm, The Yale Center for British Art, New Haven, CT. Wikimedia Commons. 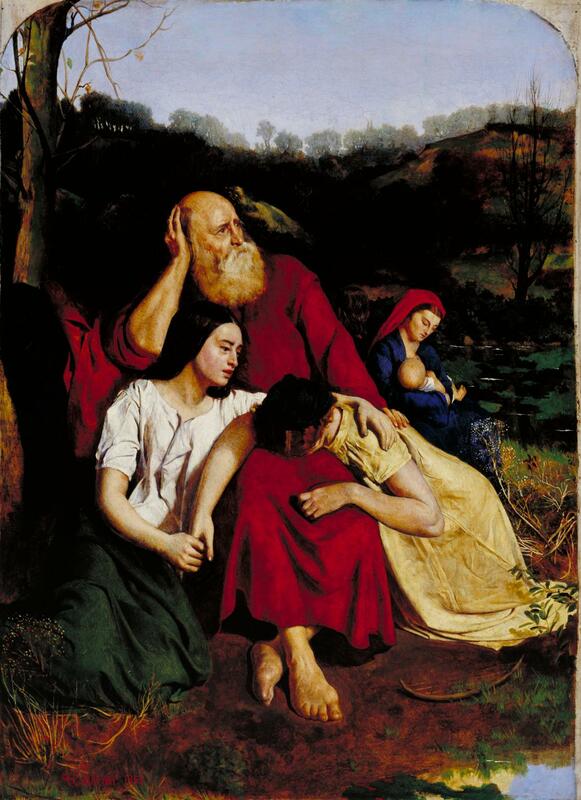 “Lord, Thy Will Be Done” (1855) is one of Calderon’s early ‘problem pictures‘, offering various clues to a narrative which remains open and invites speculation and debate, and typically contains some moralisation. Although the occasional problem picture has appeared in most periods of painting, these did not become popular until after about 1850, making this (and later paintings by Calderon) one of the earliest of the sub-genre. 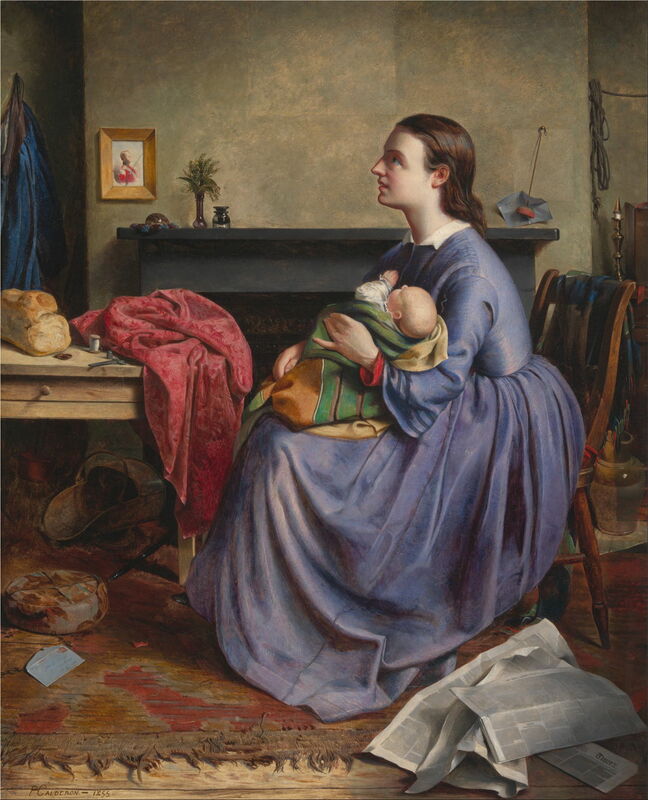 A young mother cradles her baby on her lap, looking up to the left. She appears to be living in difficult circumstances, but is not destitute. The carpet is badly worn, and the coal scuttle empty, but there is a loaf of bread on the table; she has her ‘daily bread’, in another reference to the Christian Lord’s Prayer (as in the title). A portrait of a fine young man hangs above the mantlepiece, indicating perhaps that her husband (she wears a wedding ring) and the baby’s father is currently absent, on military service. Several issues of The Times newspaper are scattered on the floor at the right, as if the woman has been following news of a military campaign overseas, for example. Under the table is a letter, most probably from her husband. Broken Vows (1856) was shown at the Royal Academy the following year, where it was a great success, and it remains his best-known painting today. It is often the only work of his which is included in anthologies of art of that period, usually without mention of his career or other work. It is another problem picture. A beautiful young woman, wearing a wedding ring, stands, her eyes closed, clutching a symbolic ‘heart’ area on her chest to indicate that her love life is in trouble. On the ground near the hem of her dress is a discarded necklace or ‘charm’ bracelet. The ivy-covered wall behind her would normally indicate lasting love, which was probably her aspiration. A set of initials are carved on the fence, and on the other side a young man holds a small red flower in front of his forehead, which a young woman is trying to grasp with her right hand. The wooden fence appears tatty, and has holes in it indicating its more transient nature, and affording glimpses of the couple behind. There are, inevitably, several interpretations, but given the title, the most probable is that the woman’s husband has been unfaithful to her. This was a popular theme for paintings, and a common one for problem pictures too. Philip Hermogenes Calderon (1833–1898), French Peasants Finding their Stolen Child (1859), oil on canvas, 42.5 × 33 cm, Private collection. Wikimedia Commons. 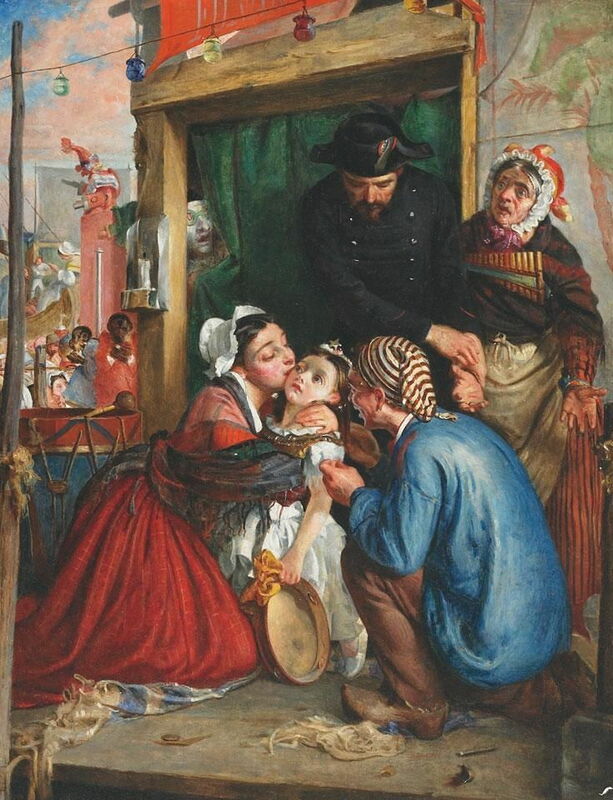 French Peasants Finding their Stolen Child (1859) is a more unusual genre painting, drawing on the troubled lives of those who travelled with street entertainment groups. Various characters from a popular street theatre play, loosely inherited now as the Punch and Judy family of plays, are seen at the side of their stage. A couple are embracing a young girl, with the girl’s apparent mother kissing her somewhat reluctant daughter on the cheek. In the background are the audience, and other stalls of a travelling fair. The entertainers in such fairs were vulnerable to crimes such as child abduction, or it may be that the couple and their daughter are not part of the fair, but local people who had their daughter abducted by travelling performers. Calderon’s narrative seems to be based on the happy ending to such an episode. Philip Hermogenes Calderon (1833–1898), Leisure hours (1863), oil on canvas, 35.5 × 25 cm, Private collection. Wikimedia Commons. Leisure Hours (1863) appears lighter in its narrative than Calderon’s problem pictures. A beautiful young woman sits on a rough wooden bench in what may be the compartment of a railway carriage. 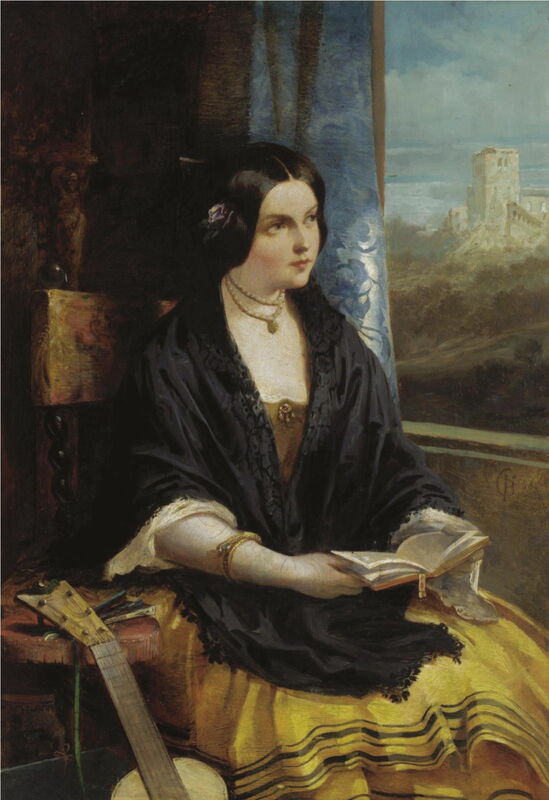 She looks out at a deeply rural Italianate landscape with a large building, maybe a monastery. She holds in her hands an open book, and beside her is a guitar, and a folded fan. She thus appears to be travelling by train across Europe, reading and making music. Those references to other arts could be construed as aestheticism. Half Hours with the Best Authors (‘The Siesta’) (1866) is a watercolour study probably for a larger painting in oils, which is not known. 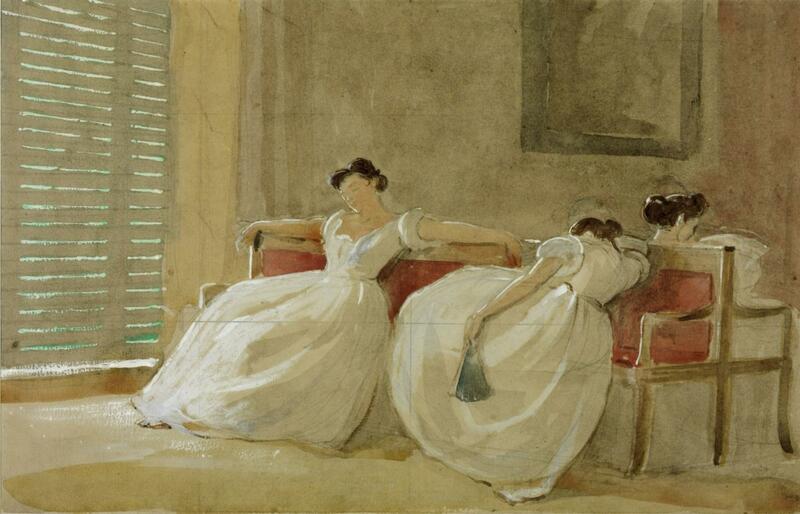 Three young women doze on large benches, the shutters closed to provide some cool from the heat of the day. 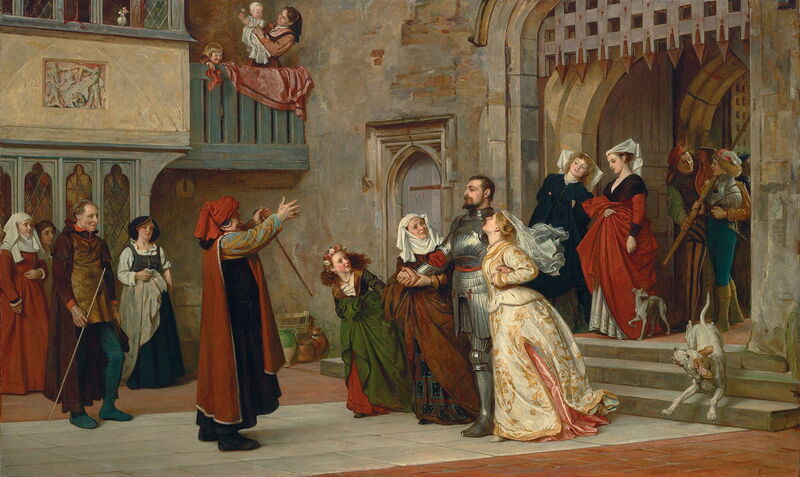 Philip Hermogenes Calderon (1833–1898), Home After Victory (1867), oil on canvas, 124.5 x 227 cm, Private collection. Wikimedia Commons. In keeping with the ideals of the Pre-Raphaelite movement, Calderon painted several elaborate mediaeval scenes, of which Home After Victory (1867) is probably his finest. Contemporary notes report that this shows a soldier (or knight) returning to the home of his father, wife, and family. His wife is already tucked within the embrace of his left arm; she looks up at him, her face full of joy at his return. His mother clasps his right hand, and in front of him his father holds both arms out to greet him. All around are other members of the family, friends, and the servants of the household, including a nurse who stands at a balcony above, with the soldier’s two young children. This painting was purchased from exhibition at the Royal Academy in 1867 by a wealthy Manchester cotton merchant. Posted in General, Painting and tagged Bible, Calderon, morality, narrative, painting, Pre-Raphaelite. Bookmark the permalink.